Act by Friday, September 28, 2018 to lock in your BEST PRICE! crafted with top-of-the-line materials and components, and we stand behind every fireplace with a Lifetime Warranty. 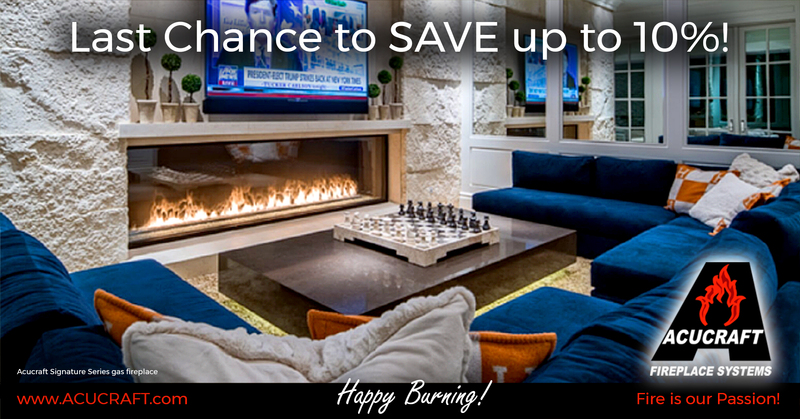 Material prices are on the rise, so now is the time to buy your fireplace system. Place your order by 9/28/2018 to lock in your BEST PRICE! No problem! Lock in your best price by placing a deposit by September 28, 2018 and we will hold your 2018 pricing for up to 12 months. The Most Versatile Gas Fireplace on the Market! Easily change out your fireplace between glass-sealed and open-flame by using the 10-minute conversion kit. To learn more about the Acucraft Signature Series, request a brochure or talk with a Fireplace Expert today!